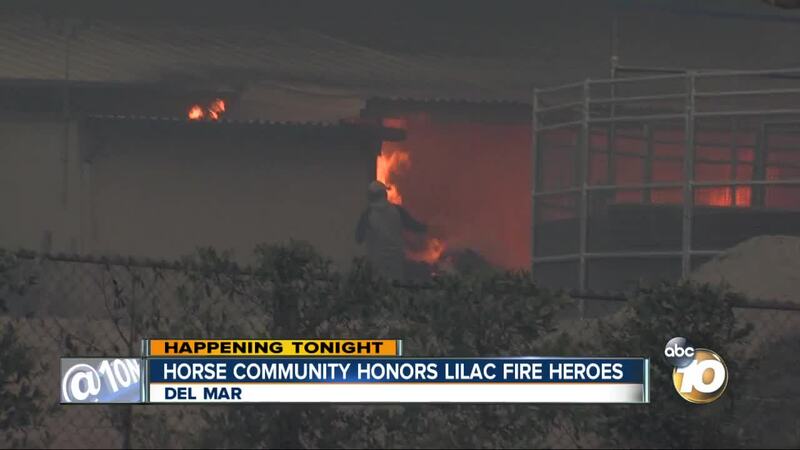 DEL MAR (KGTV) - The Annual Pacific Classic Party celebrated heroes in the horse community who risked their lives to rescue thoroughbreds during the Lilac Fire . "I want everybody who was at San Luis Ray that day to understand they were all heroes," Horse Trainer and Owner Kimberly Marrs said. She's owned horses as long as she can remember, and loves them with all her heart. Friday night, a jazz-infused, Hor d'oeuvres laden party at L'Auberge, the honorees transported attendees to smoke and flame-filled, frantic memories. "His pen was on fire because he was in sawdust, literally drug him out of the pen," Marrs said, adding that on that day she lept inside and dragged the horse out, leading him and others along the way to the infield with another worker. They were almost to the end of the tunnel when, "next thing we're facing is a 50-head herd of horses, coming straight at us. So all we could do is basically plaster ourselves against the wall and close our eyes and pray we didn't get hit because if we got hit, we would've been knocked down and trampled to death." She made it unscathed and headed back for her barn where she knew another horse was waiting. When she returned, she faced devastation. "I'm still looking for a hose to try and put him out, like I can save him. I tried to get in my barn, but it was so hot, I was stepping over flames," she said. Marrs knew he was already dead. She described it as a horrible, guilt-filled moment. For months, she the memoriy stayed with her. Friday night, that memory was brought into the light, by the horse community. They honored hers and so many others' stories of sacrifice. Noting Martine Bellocq in particular. Bellocq suffered burns to more than 60 percent of her body trying to rescue horses from the Lilac Fire. Saturday, after the third race, Bellocq will be honored for her role in rescuing the horses.